This book was written to be a classic. It sets its numerous sideways adventures around a single narrative of anti-mission: a spontaneous up and leaving of home, lover (it’s not quite clear who deserts whom) and island with no clear picture of the route to be walked ahead. It also rehearses, as a spine of ideas running through the book, the same mostly Romantic and male genealogy of literary and philosophical walkers (Rousseau, the Wordsworths, Coleridge, Hazlitt, Thoreau, and so on) that can itself now be traced back through Gros, Solnit and others to Morris Marples’ 1959 book Shank’s Pony, and an angsty, boozy, randy writer-thing (women figure as poets, “girls”, prostitutes, lovers and models, but never as walkers). Crawling, the ‘plaque tournant’ of ferry crossings, the intoxication of effortless walking within fatigue, doppelgangers on the road, inexplicable fear, the surprise of encounters (shadow boxing with a monk), the ally to be found in nothingness, the problem of right-or-left, bends (“that lovely arc between what has been and what’s to come”), going down and not up (which is easier); all these provoke passages that any walker-reader will recognise, use or savour. The lectures on acceleration and homogenisation, however, are more Daily Mail than situationist and a long section on walking in Greece and Turkey is an unconvincing attempt to set his and his companion’s ‘travelling’ in distinction from the ‘tourism’ of a timid Australian backpacker. Yet, he makes very little of an uncomfortable encounter with real outsider-nomads in Romania. Again and again comes the aspiration to change (“you want to disappear, but you can be replaced just like that... you see just how bound up with yourself you really are”); the belief that a short way ahead is a moment not only of transformation, but of beginning again. It is a dynamic of guilt and inner burden, written up as if without them. While impressively economic and impactful in description, and citing all the right materialist authorities of place without concessions to occult Psychogeography, Espedal is rather too determinist: “I’m entering a zone, an area with its own force”. In a telling reflection, he remembers travelling young with his first girlfriend to Paris where their hotel is full, but, as a favour, they are rented the room used by prostitutes to entertain their clients. They are quickly drawn into a game that becomes real: “I wasn’t myself any more, she was no longer herself”. Espedal seems to extend this experience to place in general; as though he walks the ‘open road’ in the hope that it might turn the romantic game of ‘wild and poetic’ into something real; “waiting for metamorphosis” rather than conjuring it, too dependent on a romantic ‘spirit of place’ to do the work of ambulatory wizarding to invoke it. 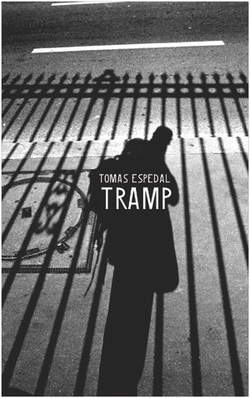 Surprisingly, given the quality of the prose (simplicity of expression and a synthesis of sources elegantly combined) and the philosophical ambition of Tramp, this book is not a well known as it might be. Published in 2006, this translation appearing in 2010, perhaps if it had appeared just a little earlier, it might have found more purchase. But walking has changed since the turn of the millennium and Tramp is very much part of a twentieth century that it is, in many respects, leaving behind.